College students aren’t just concerned with getting good grades and finding the best parties. More than ever, they’re using their smartphones to navigate life on campus. On the bus, waiting in line, in bed, on the treadmill and even while driving, college students can’t seem to put their phones down. Fifty-two percent say they often check their phones before getting out of bed in the morning, according to one study. Nearly half do so while in bed at night before they fall asleep. Thirty-five percent say they sometimes use their phones while driving but stopped at a red light, and nearly 20% say they sometimes use them while the wheels are even moving. But it’s not all addiction and danger. Forty-five percent of college students say smartphones frequently help with school assignments, and 46% say they’re often helpful for work-related tasks. The Internet education portal OnlineColleges pulled this data and more from sources including the Pew Internet & American Life Project, University of Colorado and Nielsen to produce the infographic below. Among other notable findings: More colleges students use iPhones than any other device, email has nearly caught text messaging as the most popular use for smartphones among college students and nearly half of students use their phones to check the weather. Check out the full infographic below for more information and let us know in the comments — do you think smartphones are doing more to distract or help college students? Smartphones now account for almost half of all wireless devices in use by mobile users and with that, the adoption of mobile marketing programs continues to gain strength. Even so, there are important challenges holding businesses back from executing the programs, including a lack of resources and a well thought out strategy, according to a new survey from StrongMail. Some 45% of respondents have adopted mobile marketing with 57% executing the programs for 12 months or less, 29% for one-to-two years and only 14% for three years or more. The most popular forms of mobile marketing are mobile websites (70%), mobile applications (55%) and QR codes (49%), the survey found. The top obstacle is a lack of strategy cited by 37% of the businesses, followed by a lack of resources and staff at 22%, and “not appropriate for our business” at 19%. Mobile marketing budgets remain a small fraction of overall interactive budgets, with 54% of businesses allocating 5% or less to mobile programs. Nearly a quarter of businesses reported less than 1% allocated to mobile. A lack of funding was cited by 12% of respondents as the obstacle in executing mobile programs. On the positive side, 55% report increased budgets over the past year. Even so, 59% of respondents believe that a mobile program could help them increase sales, 52% said it could improve customer service while nearly 50% of respondents reported that a strong mobile program would increase brand awareness. Forty-five percent said the programs could help acquire new customers. While marketers are integrating mobile into various components of their campaigns, this survey focused on the state of integrating mobile into email programs. Some 43% of businesses have achieved some level of integration between their email marketing and mobile marketing programs, but with mobile landing pages (32%), mobile number capture at email sign-up (25%) and mobile optimized templates (22%) being the top areas of focus. Only 27% are running cross-channel, lifecycle marketing programs that include mobile messaging. Similarly, only 29% have used mobile response data to optimize offers in email or other channels. Methodology: The global survey was conducted in April 2012 with more than 800 business leaders. 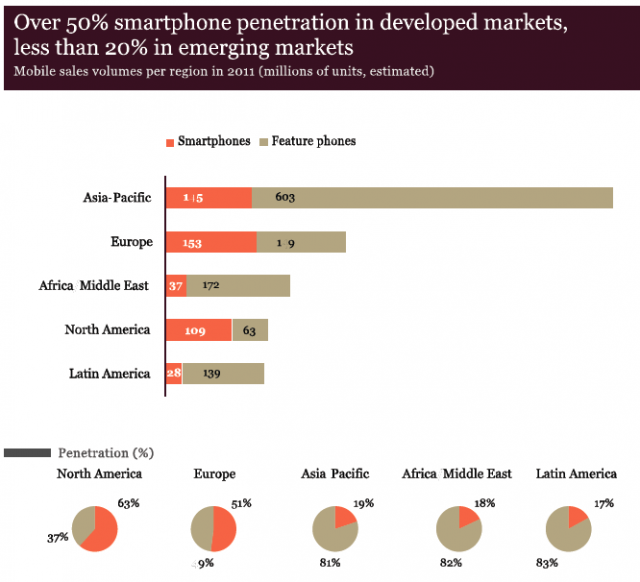 This report by VisionMobile takes a look at today’s mobile marketplace, revealing global smartphone penetration and adoption trends. With all the talk of iPhone vs. Android these days, it’s easy to forget how the majority of the world’s mobile users still make calls and access data: via feature phones. 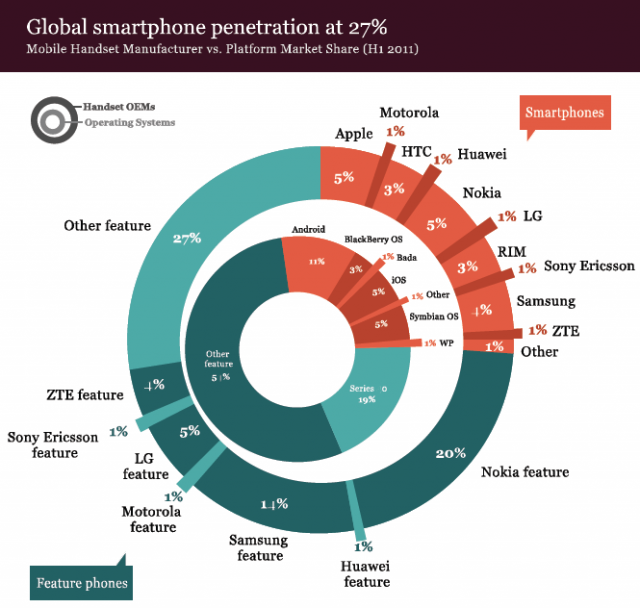 A recently released report (download) from mobile strategy firm VisionMobile takes a look at today’s mobile marketplace finding that, despite the sharp rise in smartphone shipments over 2010 and 2011, global smartphone penetration (by OS) is at just 27%. Smartphone adoption varies wildly by region, the report finds. Not surprisingly, those markets where 3G coverage is extensive and subscription plans are “post-paid” (as opposed to pre-paid) see the highest smartphone adoption rates. Meanwhile, in markets dominated by pre-paid subscriptions, the real battle is price. Here, Nokia’s mid-tier Symbian platforms and BlackBerry consumer-targeted models are still holding onto significant market share. However, both platforms are now facing threats from low-cost Android phones, thanks to the latter’s pricing versatility. Android devices today sell for anywhere from $100 to $750 (USD), allowing the phones to compete both on the high-end and the low-end of the pricing spectrum. In the North American and European markets, smartphone penetration is the highest, with 63% and 51% market share, respectively. In the Asia-Pacific region (19%), Africa/Middle East region (18%) and Latin America (17%), it’s much lower. As for today’s smartphone leaders, it really is an iPhone vs. Android world out there, since former mobile leader Nokia was slow to react to the iPhone’s coming, and steadily lost ground in the high-end smartphone market. Nokia’s decision to move from Symbian to Windows Phone allowed other Android players an edge, including Samsung, HTC, Motorola, LG, Sony-Ericsson as well as newcomers like Huawei, ZTE, Acer, Dell and Asus. Despite the numerous differences between the two leading smartphone platforms, iOS and Android, there are some notable similarities. Both originate from non-telecom players. Both are monetized indirectly. (Instead of software license sales, they either profit from high-margin device sales or, in Google’s case, enhancing its online ad business). And both are driven by companies able to sustain investments of billions of dollars in order to develop an OS and create the accompanying developer and app ecosystems. And yet, even though it’s “Android vs. iPhone” in terms of consumer choice, VisionMobile says there won’t be a single winner in the smartphone race. Both platforms have reached critical mass with hundreds of millions of users, making it almost impossible to displace them. As for RIM and Windows Phone, the jury’s still out on whether or not there’s even room for a third player and whether Microsoft, with Nokia’s help, can move into position number three. Although the report doesn’t dive into speculation about what happens next, when the rest of the non-smartphone world upgrades their handsets, it does examine the network effects belonging to today’s dominant players. Not only are these platforms winning because of their technological sophistication, but also because of their application ecosystems. 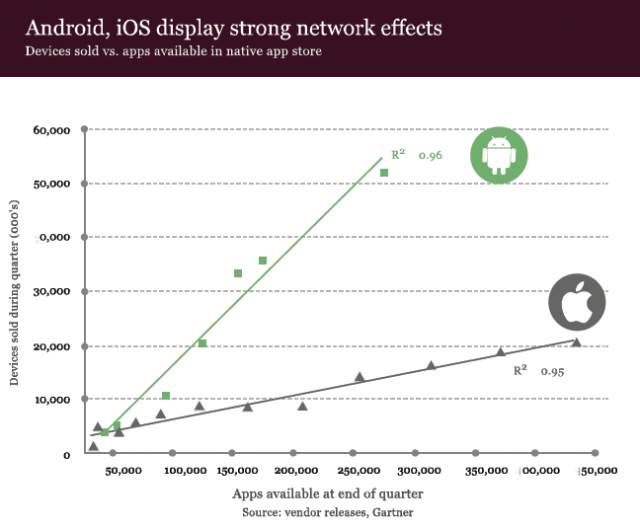 With 500,000+ iOS apps and 300,000 on Android, both platforms have reached critical mass. When that occurs, the platform begins to grow exponentially. However, app counts alone aren’t the ultimate measure of long-term health – the sustainability of the developer ecosystem is. 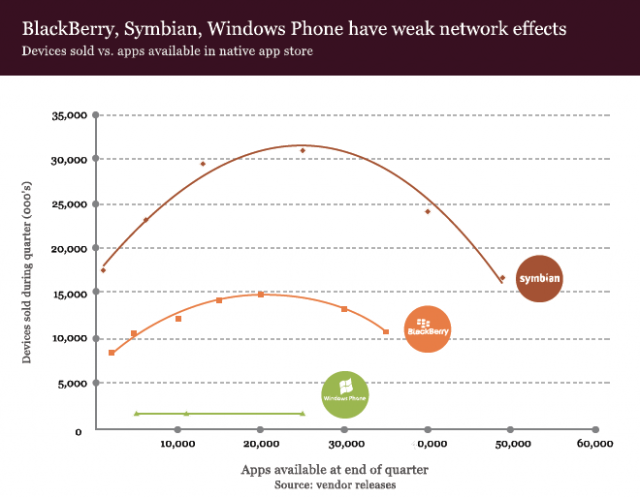 What’s interesting is to see the network effects in terms of mobile apps plotted out for all the top smartphone players. Below, the graphs show the number of apps available on a particular platform at a particular point in time, and the number of devices shipped for that platform in the quarter just preceding it. The resulting charts show just how popular Android and iOS are, and how difficult a battle it will be for a third major smartphone player to emerge. You can also see the challenge that Apple faces as it attempts entry into emerging markets to take its share of the feature phone upgraders. As the report notes, Apple has high margin device sales, which means it doesn’t have as much flexibility in terms of hardware discounts as Android does with its $100 phones. But Apple did something else recently – when it brought out the iPhone 4S, it greatly discounted the prices of older model iPhones. The iPhone 3GS became free and the iPhone 4 was just $99, both with 2-year commitments. However, while that’s a viable strategy in attracting price-sensitive consumers in post-paid markets, it’s not necessarily going to be enough to attract pre-paid consumers to switch subscription plans. It’s the data bill that’s the killer, not the initial cost of the phone. If that’s Apple’s pre-paid strategy, it looks like the iOS vs. Android battle in emerging markets may just now be heating up. And given how much of the world is still yet to upgrade, it’s a long fight ahead. This text messaging infographic created by MBAOnline presents some interesting statistics about the world of SMS.